Despite the pocket door being popularized since more than a century now, pocket doors market, as an independent business space in itself, has made its way in the construction industry only since the last few years. Presently, driven by the architectural benefits provided by these products, in conjunction with the adoption of space optimization and novel construction designs, pocket door industry has been gaining exceptional traction. Having recognized the potential these components have in modern construction, startups and established companies alike have been attempting to penetrate pocket doors market. Of late, on account of capital and space restraints, an increased preference has been observed for smaller living spaces, especially in new building constructions. The demand for more space has overtly led to the necessity of freeing up the floor space occupied typically with doors, further strengthening the demand for pocket doors. 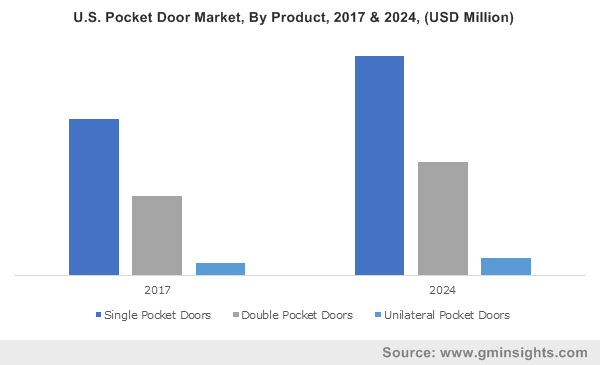 In addition, surging renovation and refurbishment of old monuments and residential buildings is also poised to increase the demand for these components, propelling pocket door market size over the years ahead. With global construction industry growing at a commanding pace, pocket door market boasts of a superior opportunity to depict considerable expansion in the forthcoming years, driven by heavy investments in space-saving construction and infrastructural development projects across the globe. Lately, many of the construction companies are signing long-term deals with suppliers for ensuring continuous product supply. Recently in 2017, Bellway Homes apartments in London, outlined a plan to develop two luxury design thirteen-story residential apartments incorporating the popular Eclisse pocket doors. The apartment comprises numerous contemporary design features like suit shower rooms, balconies, integrated kitchen appliances, and open-plan living spaces, which could increase the requirement of pocket doors on a large scale. In addition, Bellway Homes has also installed single pocket door systems at Homerton Baptist Church, London in 2018. It is thus rather overt that with the increasing deployment of these components across residential and commercial buildings, single pocket door industry size will register a CAGR of more than 5.5% over 2018-2024. Elaborating on the refurbishment of older buildings, it would be prudent to state that of late, the owners of numerous heritage structures have been working toward enhancing the design of these buildings to improve their aesthetics. For instance, the 175-year-old Boerum Hill townhouse in Europe has recently been given a makeover with pocket doors incorporated in the design. The townhouse features a dining room, kitchen, and living room with hardwood floors. In order to lend a decorative touch, the place has been refurbished with wooden pocket doors to enhance the look and feel of the townhouse as well as ensure design flexibility. The use of wood as an appropriate material for manufacturing pocket doors is thus gaining popularity, which is certain to augment pocket doors market size from wood. Incidentally, wood material accounted for 45% of the overall pocket door market share. It is essential to mention that although pocket doors are becoming more popular across the globe pertaining to their architectural benefits, over time, these doors are bound to witness a few common mobility issues like roller failures. In addition, these doors are not smoke and fire-rated, and could easily allow smoke to pass over. Considering this fact, most of the key players in pocket door market are looking forward to bringing forth a spate of innovations in product development that can overcome these restraints. The shifting focus of product manufacturers toward the development of sealed pocket doors for achieving fire protection benefits will have a positive influence on pocket door industry trends. In order to develop fire-rated pocket doors, product manufacturers are also planning to use glass or aluminum material owing to its non-corrosiveness and thermal insulation characteristics. The ample availability of these materials will fuel the future advancements in pocket door market. The proposed future prospects for pocket doors market are expected to generate a plethora of opportunities for construction magnates. As these companies continue to invest further in the refurbishment of age-old buildings and the development of innovative residential as well as commercial buildings, pocket door market is likely to gain exceptional returns in the years ahead. As per estimates, pocket door industry size is expected to be pegged at over USD 10 billion by the end of 2024.